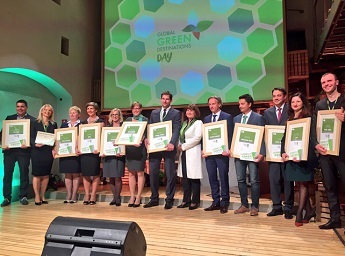 Ljubljana, 27 September – Slovenia has become the first Green Destination in the world, and Ljubljana has two placements among the TOP 100 Sustainable Destinations. Other best practices of green and sustainable tourism in the world also received awards within the scope of the Global Green Destinations Day International Conference. Various Slovenian destinations and providers also celebrated their victories at the Ljubljana Castle.